Remove the skin and white pith from grapefruit with a sharp knife. Working over a bowl, cut the segments from their surrounding membranes. Cut the segments in half on a cutting board and transfer to a large salad bowl. Squeeze the grapefruit peel and membranes over the original bowl to extract 1/4 cup grapefruit juice. Whisk oil, scallions, vinegar, salt and pepper into the bowl with the grapefruit juice. 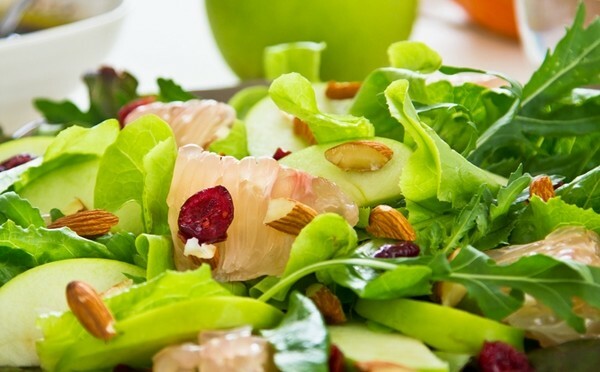 .Add greens and apple slices to the salad bowl with the grapefruit segments. Just before serving, toss the salad with the dressing until well coated. Sprinkle cranberries and pine nuts on top.